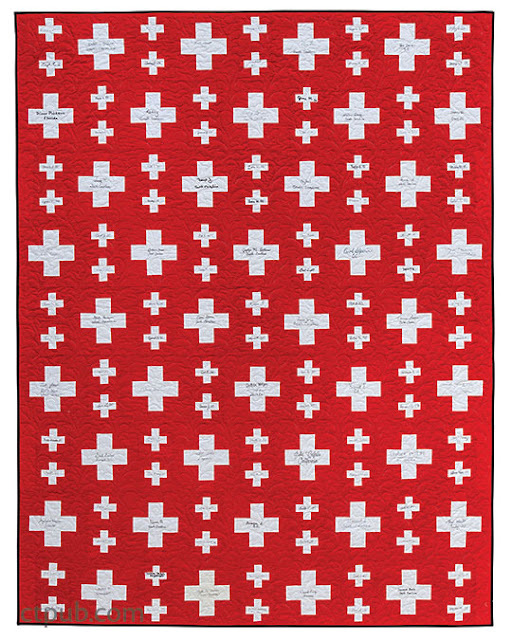 This design is easy to do on a domestic (or longarm) sewing machine and requires very little marking. 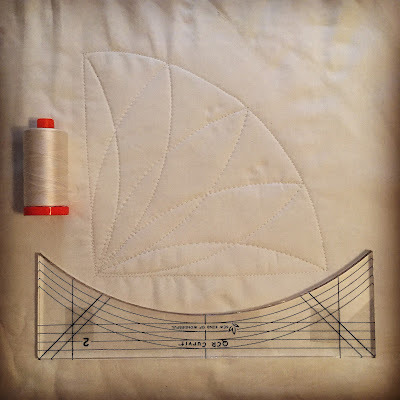 For this design, I used my Bernina ruler foot on my domestic machine and set up my machine and ruler according to my 5 tips for successful domestic ruler work post here. 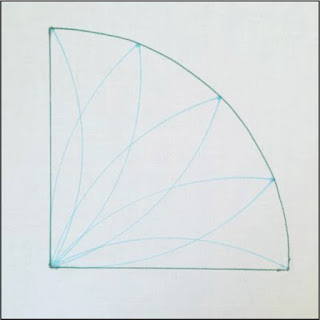 The ruler I used was the Quick Curved Longarm Ruler (affiliate link) I got off of Amazon, but you could make this work with any gentle curved ruler. Before I used the ruler for the first time, I added a couple of Handi Grip Adhesive squares to the back of the ruler, which I find helps a tremendous keeping the ruler from slipping on the fabric. To start, here is my drunkards path "block", drawn in Sharpie on a piece of fabric. For the first part of the design, you only need to mark the center and quarters on the curve of the block (using a removable marking method). Because I had a lot of blocks to mark, I put marks right on my template so I could mark all of my blocks quickly and consistently. 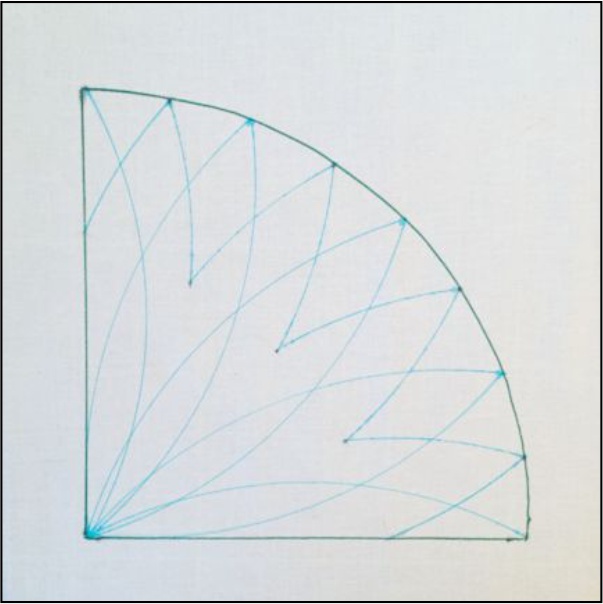 Starting in at one edge of the curve and using your ruler, quilt a curved line down to the lower corner. Next, travel from the bottom corner up to the quarter marked line on the curve edge. 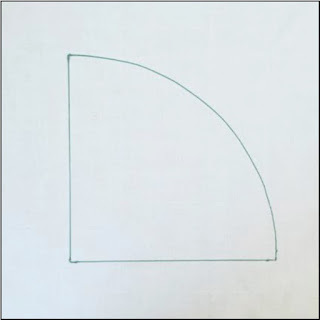 Continue going up and back to each mark on the edge of the curve until you reach the other side of the block. You can stop here and have a very nice quilting design that has a petal-like quality to it. This was my original design, but when I quilted Flutter, I felt that the space between the quilting lines was a little too large compared to the other quilting on the quilt so I added a second layer of quilting. To add the second layer of quilting, mark (I just approximated the positioning) between the first set of marks on the curve and between the where the quilting lines intersected in the middle of the block. These marks are shown as gray dots on the block below. Quilt this second layer of quilting just like the first. 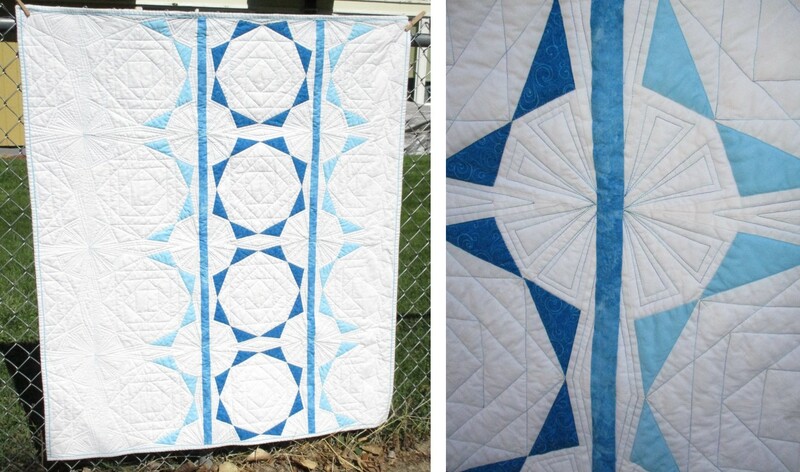 This extra quilting really makes the design look complicated and gives movement to the quilting. I hope that my tutorial was clear and helpful, happy quilting!! 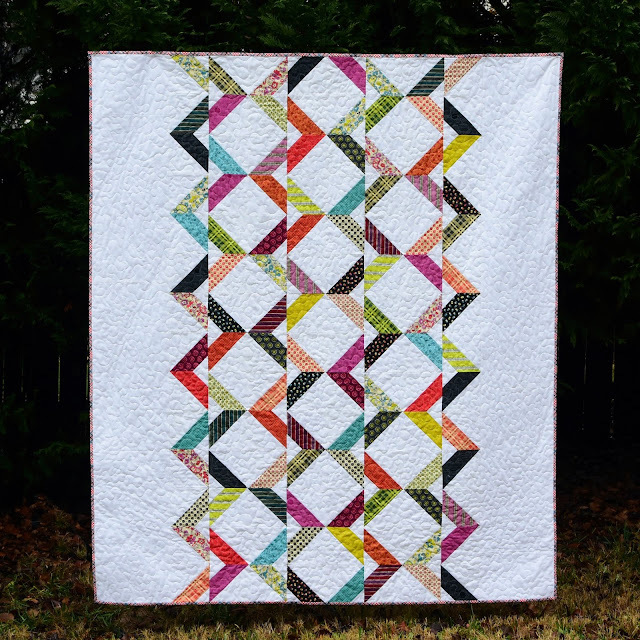 Today I am so excited to show you one of my quilt finishes from last fall! The quilt is called Flutter and it appears in the just published Modern Quilts Unlimited Magazine Issue 22. I would like to thank Robert Kaufman for the beautiful fabrics: Kona Cotton solids in flamingo, lipstick, navy, and white. The batting was Warm & White by the Warm Company and Aurifil thread was used in the piecing and quilting. The curved blocks are a nice, large size so the curve was easier (and quicker) to piece than I had thought they might be. Pretty soon the quilt top was finished and I was trying to figure out what quilting design I should use. An allover design did not seem like the right fit, so I went with a custom quilting design. I used a matching 50 wt Aurifil thread in each section. I quilted the background in a very small and tight stipple and outlined all of the butterfly pieces. I quilted the dark blue plus signs using a dense back-and-forth design and quilted the curves using a special motif I designed using my new Quick Curve longarm rulers (affiliate link) and my Bernina ruler foot. Here was a test quilting sandwich I used to test out my initial design for the curved shapes. I decided that they needed a little more quilting so I added a few more lines to it for the final design. 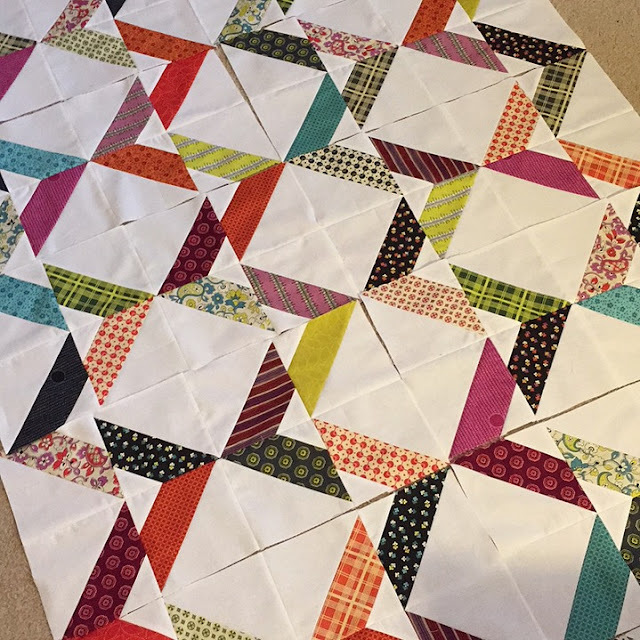 I was really pleased with the quilting design, I think that reinforces the butterfly look to the blocks. I am planning on writing a little tutorial on how to stitch the design and post it next week. You can find the Quick Curve quilting rulers here (affiliate link) and check out my post about 5 tips and tricks for ruler quilting on a domestic machine here. I had a lot of fun working on this quilt. 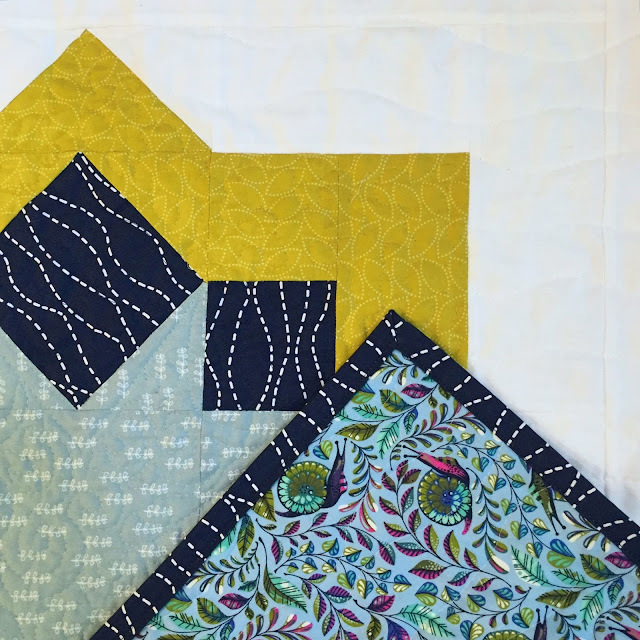 Flutter is going to be hanging in the Modern Quilts Unlimited booth at QuiltCon next month (and I will be in the booth for a few hours) so if you attend QuiltCon, please stop by! I love the Modern Quilts Unlimited magazine, the magazine is so full of great quilts and inspiration. 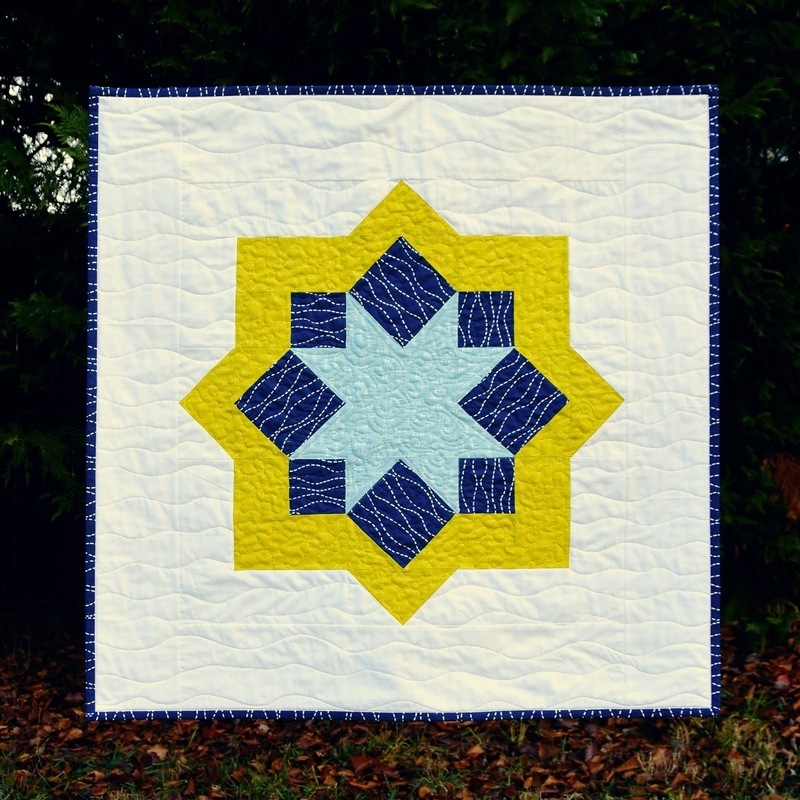 Check out Modern Quilts Unlimited Issue 22! I was excited to see a post on the C&T blog today highlighting our soon-to-be-released book (books will ship from C&T in two days!!). 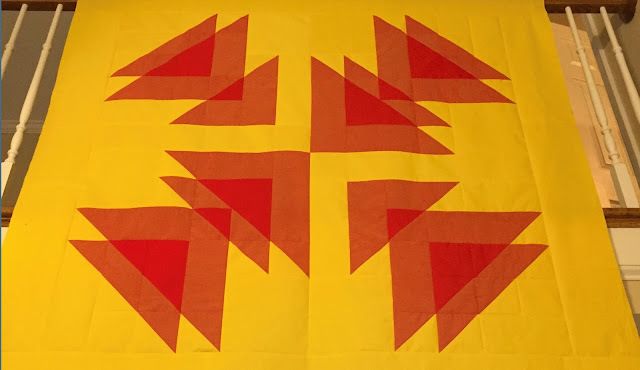 The post uses an except of the introduction section of the book which explains a little about the history of the plus sign as a design element in quilts. 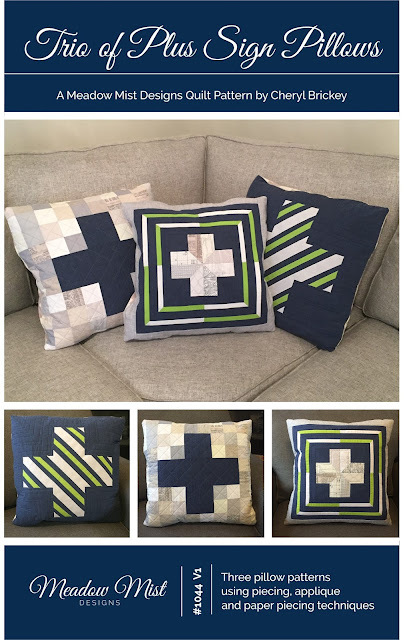 Click here to hop over and read the post as well as see some of the additional plus sign quilt patterns that are included. Plus signs have been a universally appealing design in popular culture for over 100 years, forming some of the most recognizable logos in the world. 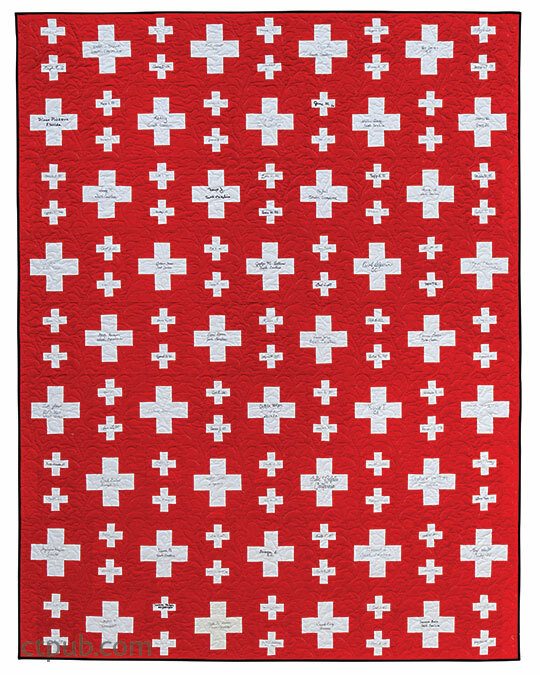 There is no mistaking the logos of the American Red Cross and Swiss Army. Drawn to this simple and strong geometric shape, quilters have used plus signs extensively throughout history. 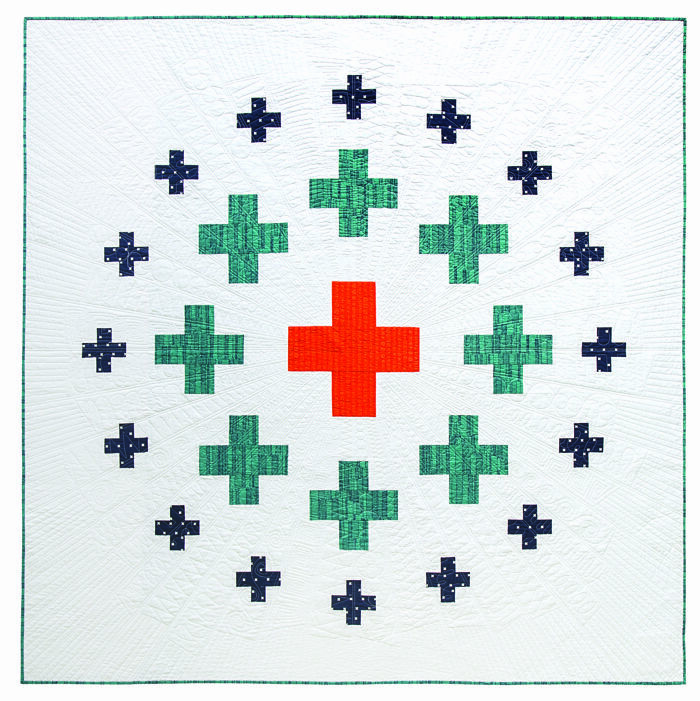 Some of the first popular plus sign quilt designs were signature quilts made in the early 1900s to support the Red Cross during World War I. 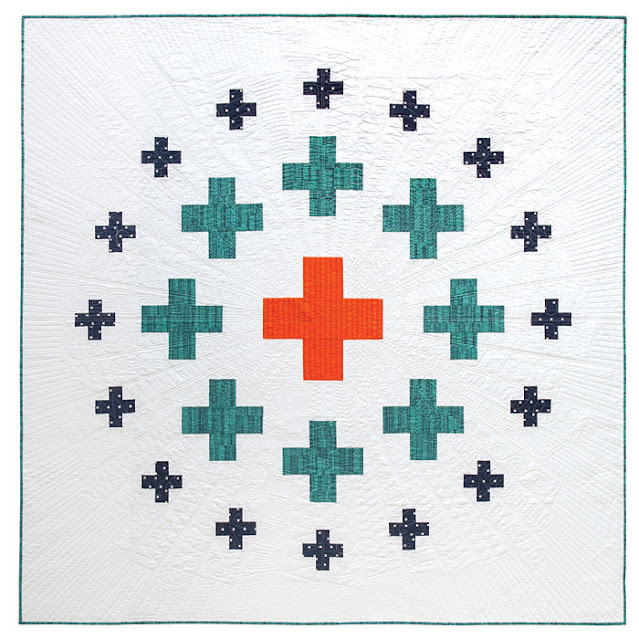 Individuals and businesses would pay a small fee to have their name embroidered on such a quilt, and then the finished project would be raffled off to generate additional funds for the cause. 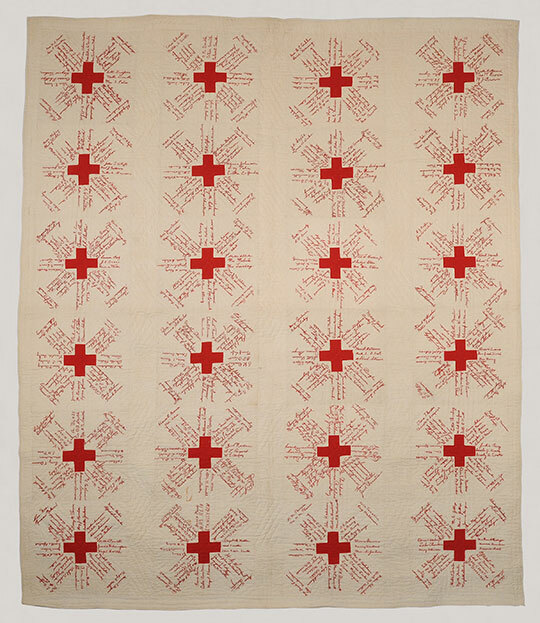 The following vintage Red Cross quilt was made in Lake County, Illinois in 1915, with each resident paying 10 cents to have his or her name embroidered on the quilt. Each of the blocks contained 1 red plus sign and about 40 embroidered names on the white background. 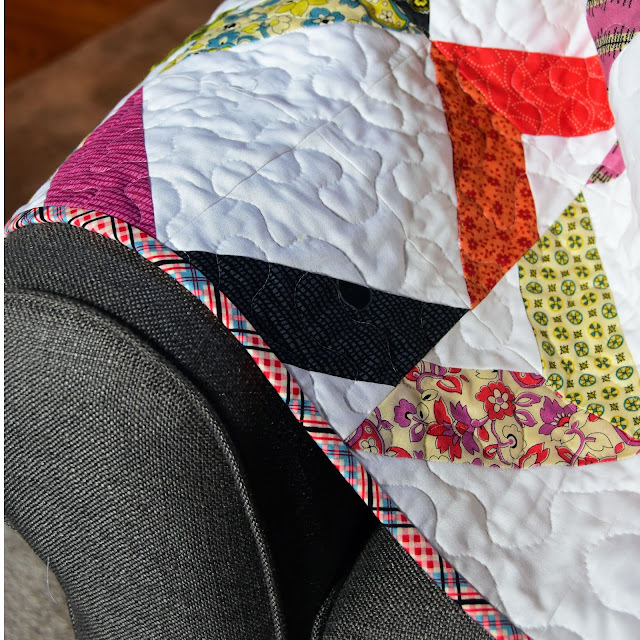 I am honored to have a quilt included in the book. 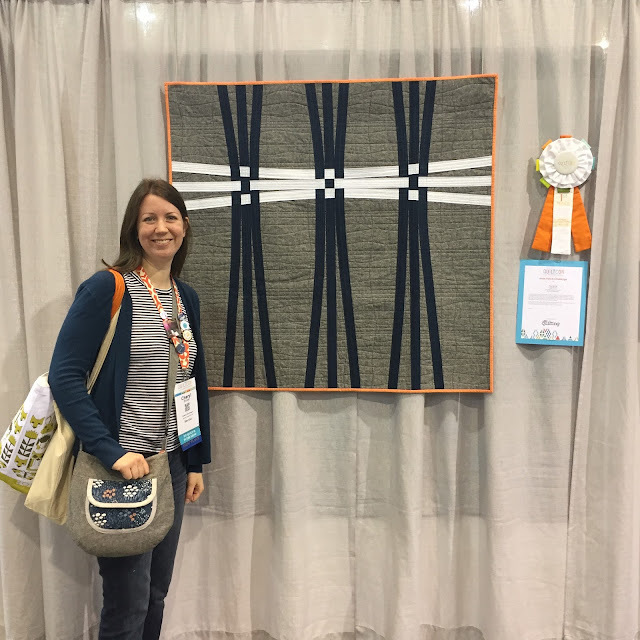 I made Warp and Weft for the QuiltCon 2017 APQ 9-patch challenge. It actually took first place! A little about the quilt...about a month before the QuiltCon submission deadline, I was at work drafting a new patent application on a woven fabric (I write patents for a private industrial textile and chemical company). 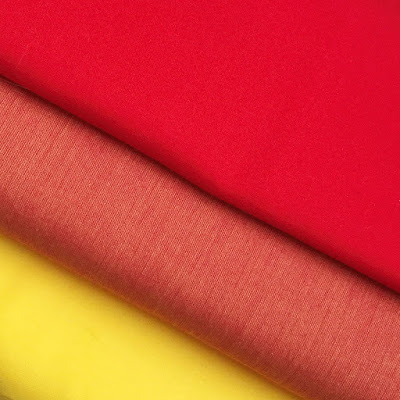 The fabric was similar to a shot cotton where the warp yarns (that go along the machine direction) and the weft yarns (that go perpendicular to the machine direction) were different yarns. I noticed that it kind of looked like a 9 patch. Thus my woven 9-patch idea was born. There is such eye candy and inspiration in the book, so consider getting a copy of the book to see all the pieces. 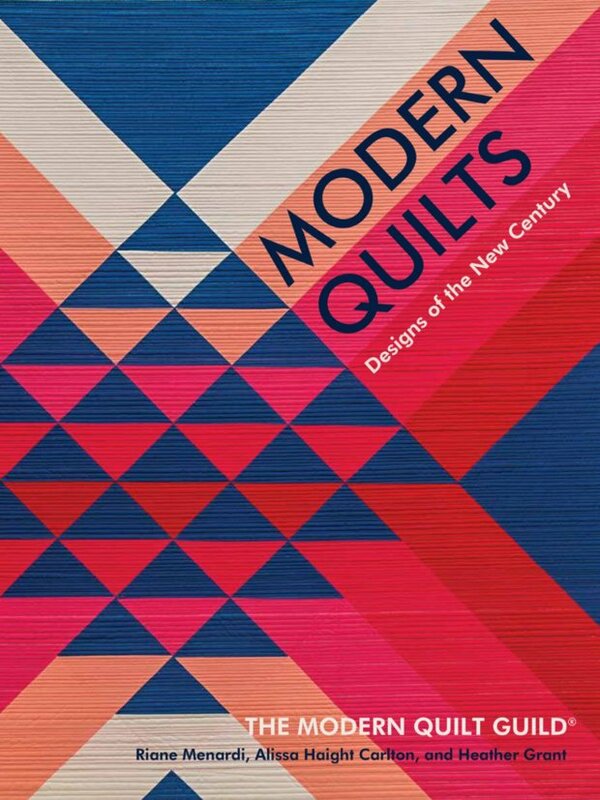 100% of the royalties earned from the book go to the Modern Quilt Guild, a 501(c)3 non-profit organization. Here is the full list of participants in the book hop. 1/20/18 Cheryl Brickey Meadow Mist Designs ← that's me! 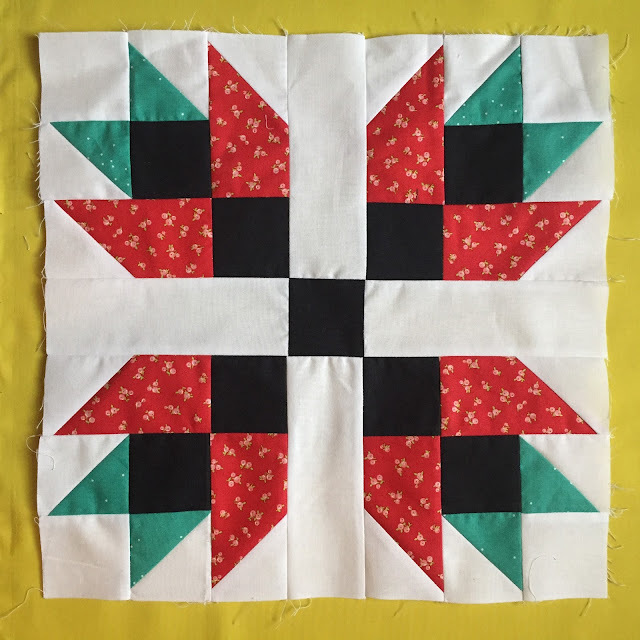 It is rare that I remake a pattern, there are so many new quilt designs on my to-do list, but I had so much fun making a second version Arrow Point Path as a Christmas gift. I decided to make my son's cub scout leader a quilt for Christmas. He has been the leader of the troop for 5 years and with my son bridging up to boy scouts in the spring, I wanted to make him an extra special thank you. 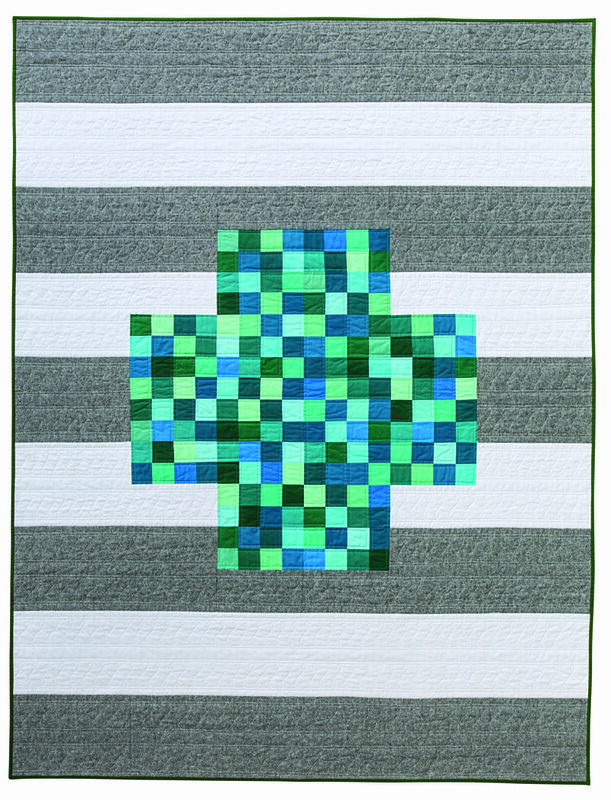 I needed a quilt design that would be a relatively quick make and one that I thought he (and his family) would like. I had a bunch of charm packs of 6" square (yes, strange size) of Chicopee by Densye Schmidt. The Chicopee line has been one of my all time favorites and I was looking forward to making it into a quilt. I was also excited to see how the design would look using prints versus the blue and green solids of my first version. My pattern Arrow Point Path, which I designed as part of Quilt Theory, fit the bill perfectly. The pattern requires 6" sq prints along with a background fabric. I had the white background fabric and the Tim Holtz Documentation print from the Eclectic Elements collection for the backing fabric in my stash so I was already to go! The blocks came together easily and soon the quilt top was done. At this point, I needed to gift the quilt in 4 more days so a quick quilting design was a must. I love stippling a quilt so I stippled using the soft white (2021) 50 wt Aurifil thread. I had the entire quilt quilted in less than 2 hours. I bound the quilt using another Densye Schmidt print I had in my stash, from Shelburne Falls, I really like the look of the plaid printed on the bias. After taking some pictures, I washed the quilt to give it that crinkly, soft look. 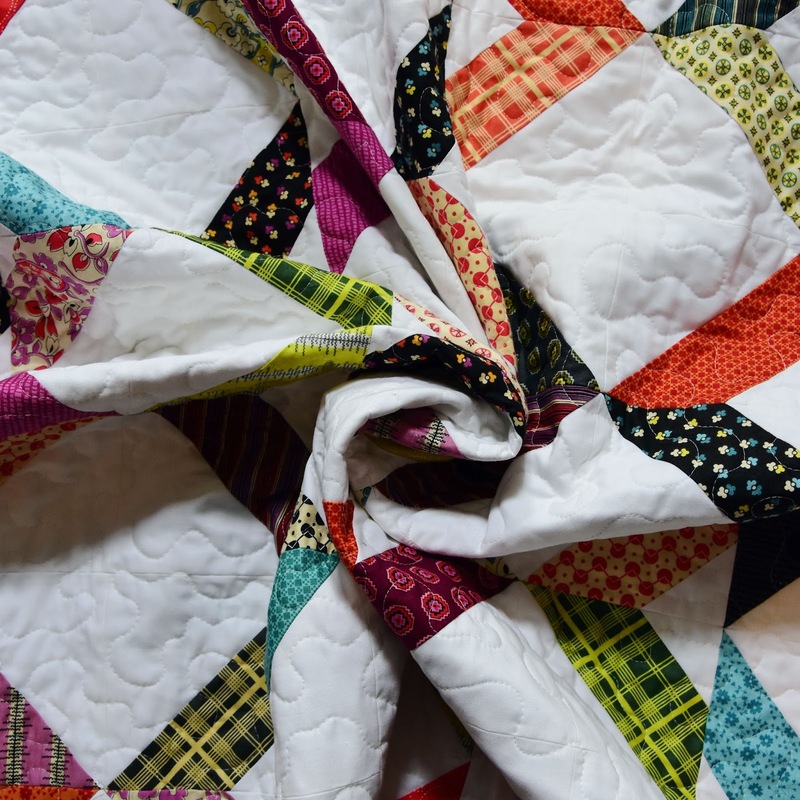 I am always worried if I gift a quilt without washing it, the recipient will think that they did something wrong washing it when it comes out of the dryer looking so different. Here is a picture of the yummy texture of the washed quilt (sorry for the indoor shot, it was super windy out and I had to gift the quilt the next day). My son's cub scout leader and his family loved the quilt. He was amazed at how I had quilted it. 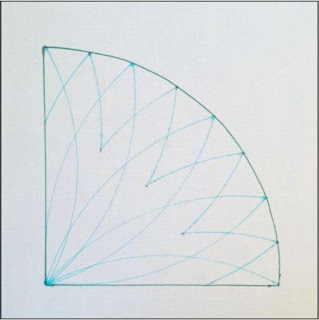 It was a good reminder to me that to those that do not quilt and are not familiar with quilting, simply moving the quilt under a stationary needle to create a quilting design (no matter how simple the design is to us) is truly impressive to others. 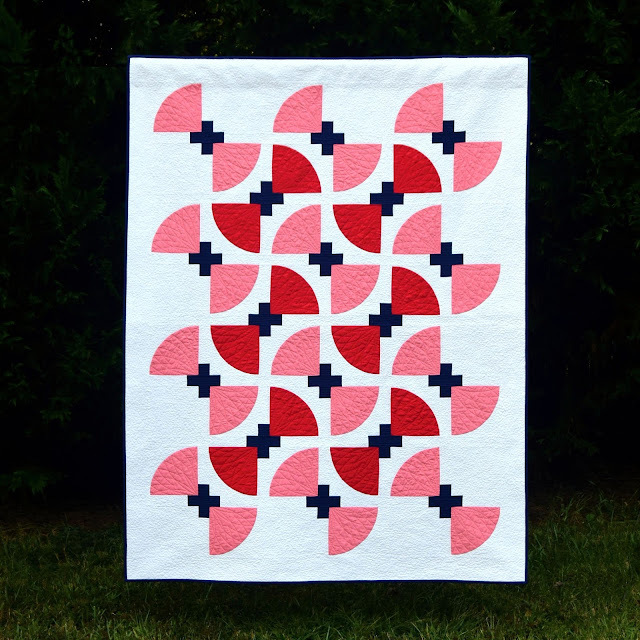 I love seeing the quilts made with Meadow Mist Designs patterns! Here are just a few that have been floating around blogland / Instagram recently. Jan made a version of On a "Jelly" Roll (my number one best selling pattern) using a jelly roll of Simply Colorful by V and Co. for Moda. I love the purples and the texture of the quilt design. 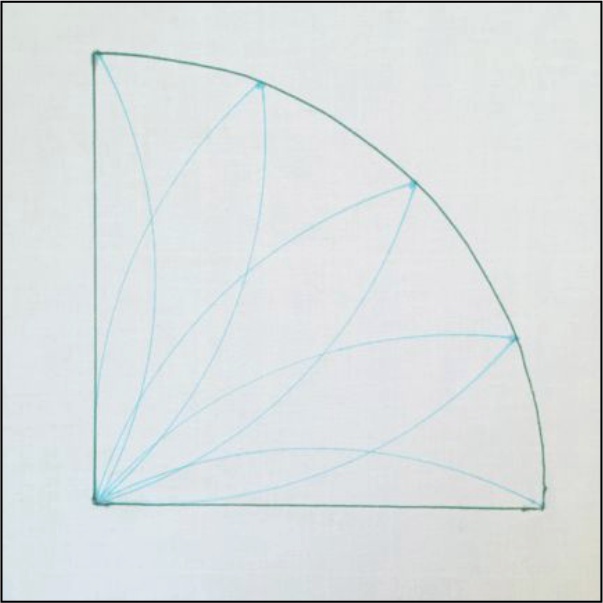 Rochelle made an awesome version of Half Circle Mirror, using blues for the circle shapes. 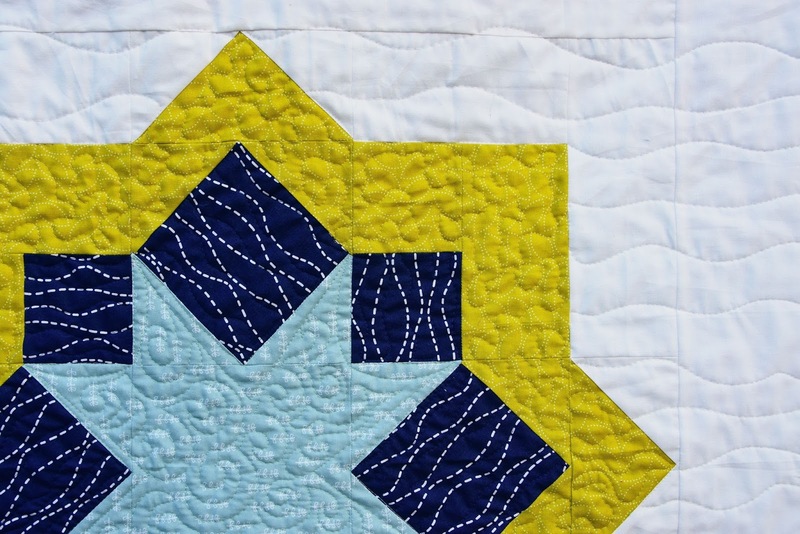 Look are her quilting, I love what she has done with the negative space. 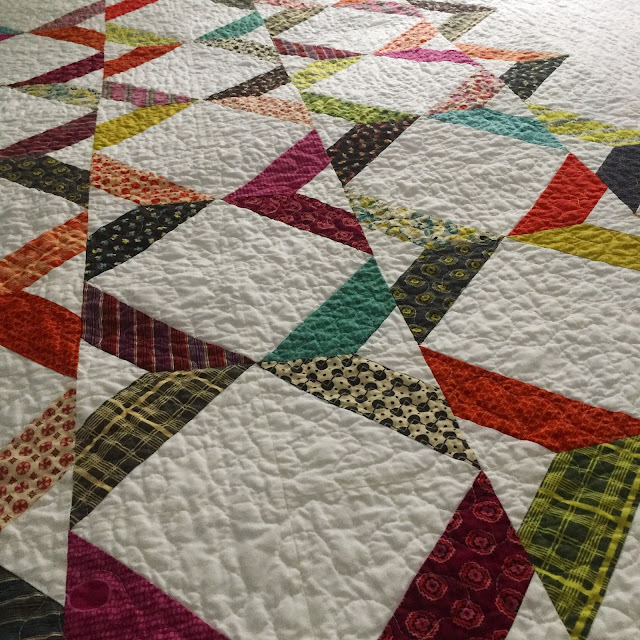 Before you read any further, go hop over to Liz's blog and see her gallery of finished quilts for some jaw dropping quilting. Aren't Liz's quilts simply amazing? I was so excited when she told me she was working on a version of Arrow Point Path (a quilt pattern I designed for Quilt Theory). I just love her version! Tish is an amazing quilter, tester, and pattern designer. She tested this year's mystery quilt, the Magnolia Mystery quilt, and just recently finished quilting last year's mystery quilt, the Meadow Mystery quilt. I love the colors she used and the quilting is amazing. 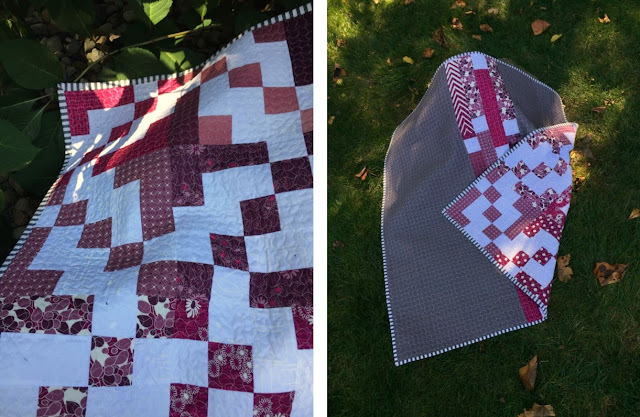 Between Tish and her husband David, they have made four versions of the Meadow Mystery Quilt! 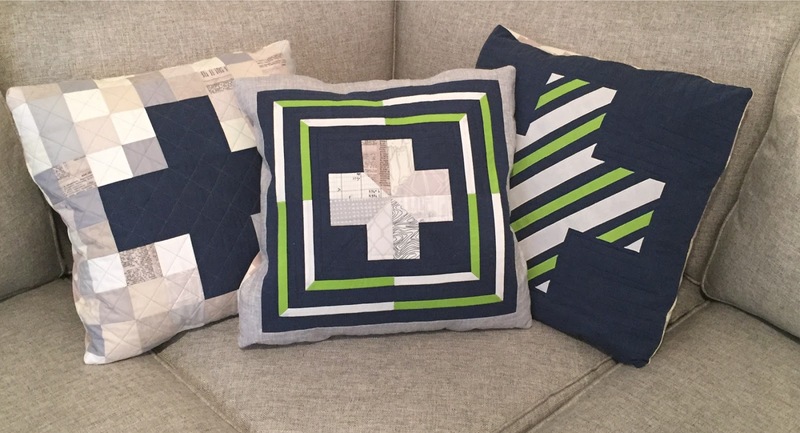 Many thanks to Jan, Rochelle, Liz, and Tish for permission to highlight your quilts! 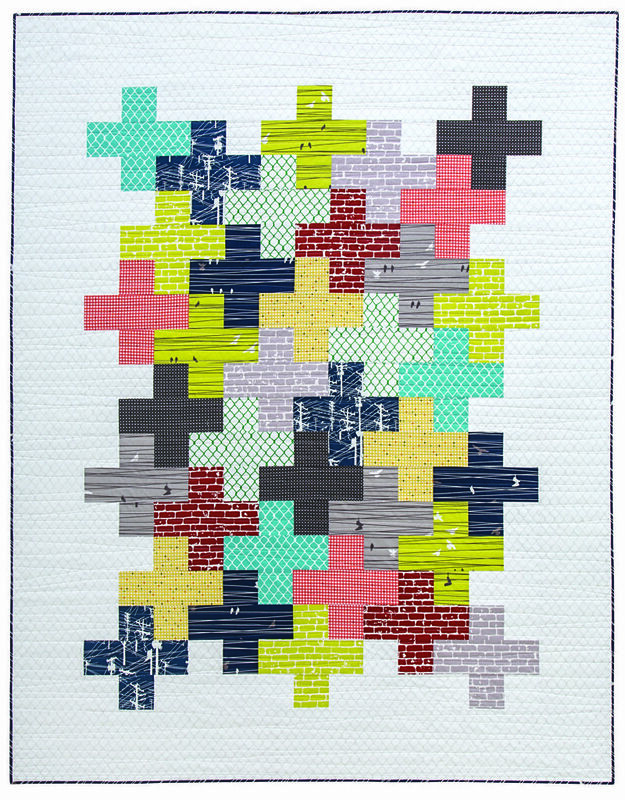 I have been taking part in Yvonne @ Quilting Jetgirl's free quilt along called Wayward Transparency. 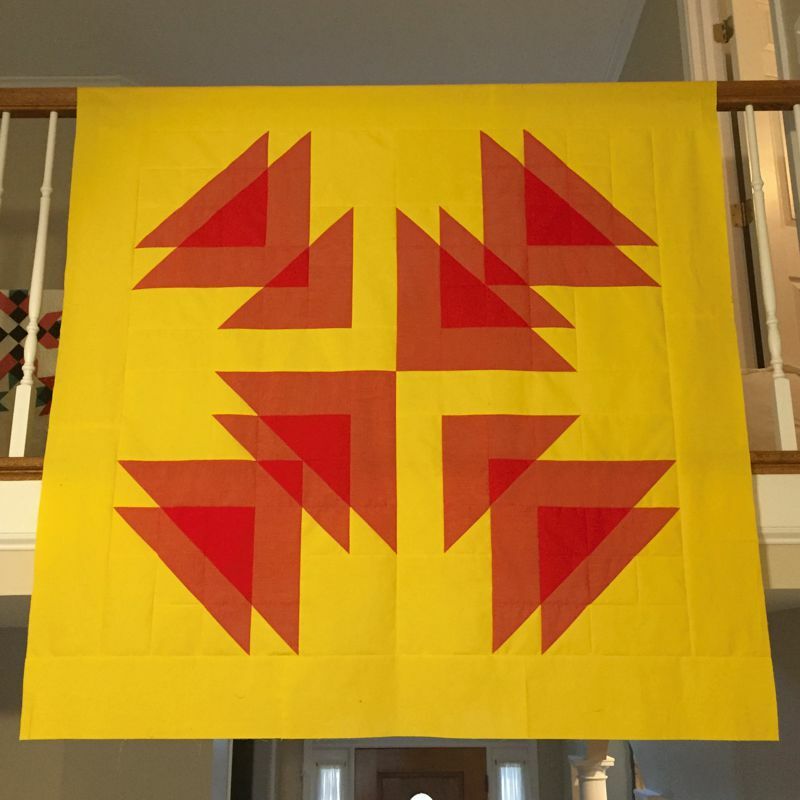 I got a late start to making the quilt due to some other quilting deadlines, but I am happy to have been able to finish up the quilt top in time for the quilt along linkup. 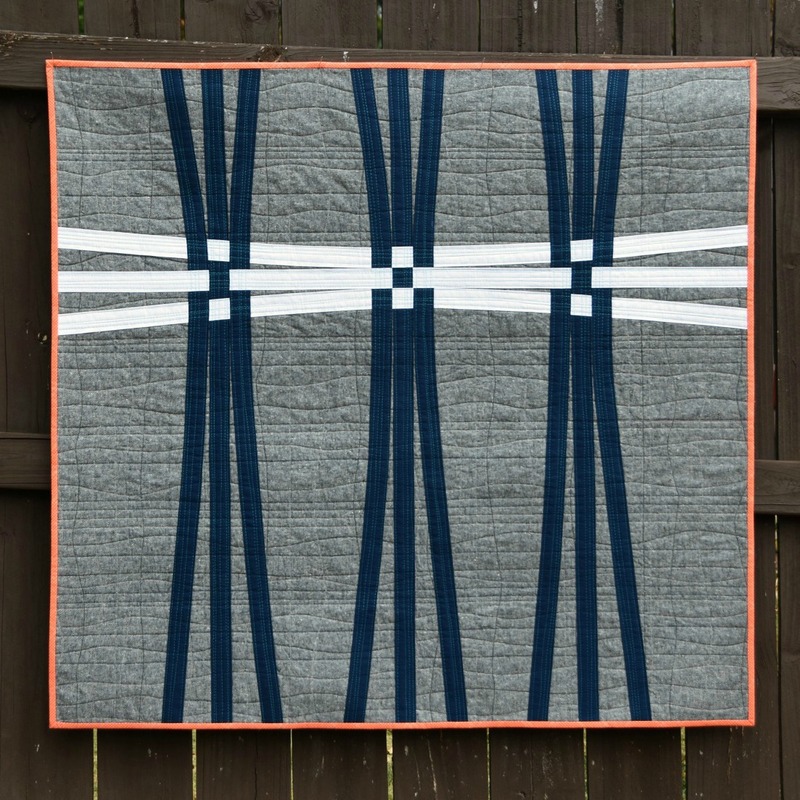 Yvonne creates amazing quilts with a transparency effect and Wayward Transparency is one of my favorites she has created. 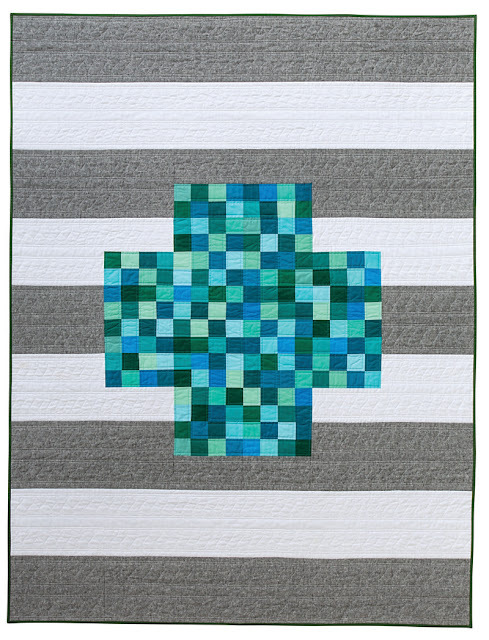 You can find all of the information and instructions for the quilt along right here. The quilt top came together very quickly and easily. Yvonne offers 2 different versions, a traditional setting and an on-point setting (and many different layouts of the blocks within each setting). I initially thought I was going to do the on-point setting, but once I had the blocks together, I decided that I really liked the look of the triangles going out on the diagonal so I went with the traditional. I added a small border to float the design a little more and my top was done! 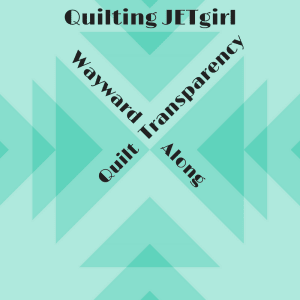 I am still not sure how I am going to quilt this quilt, but all of the quilts showing up on Instagram #waywardtransparencyqal and on the Quilting Jetgirl Facebook group are giving me some great ideas. Thanks Yvonne for hosting such a wonderful quilt along! 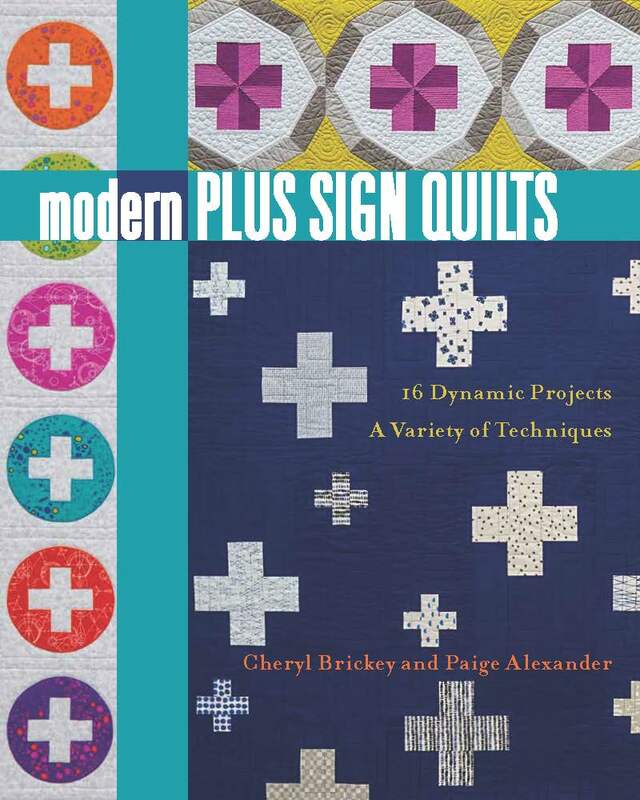 At long last my book, Modern Plus Sign Quilts, is going to be publishing soon! It seems like forever ago that my co-author Paige and I were brainstorming quilt patterns for this book (it was spring of 2015!). 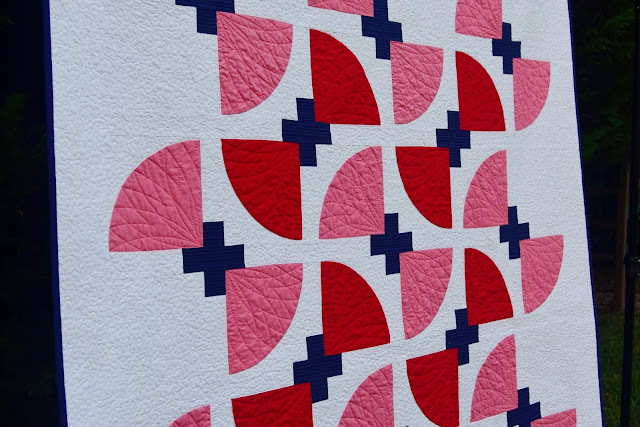 The book contains 16 different quilt patterns from baby to queen sized and uses a variety of techniques. 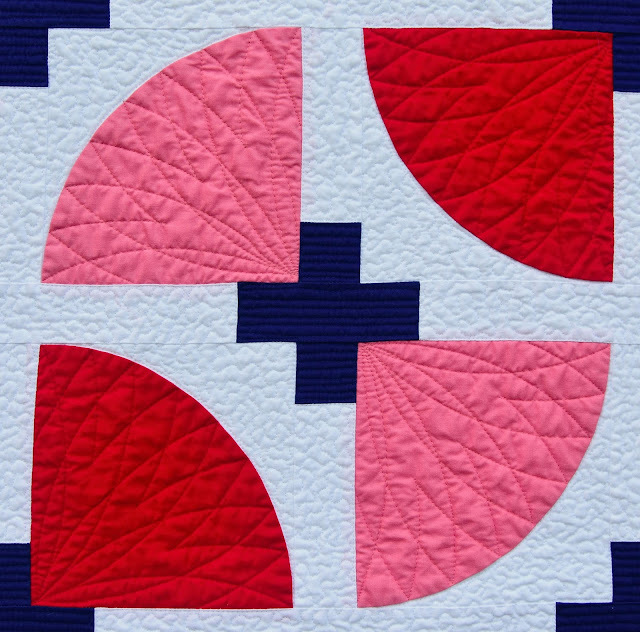 There are traditionally pieced quilts, along with paper pieced designs and appliqued designs. I am happy to offer pre-orders of signed books through my Etsy shop! If you are local to the Greenville, SC area and you would like to pick you book up at either a Foothills Piecemakers Quilt Guild or the Greenville Modern Quilt Guild meeting, you can use the coupon code LOCAL to remove the shipping cost. You can also purchase a copy through Amazon (affiliate link) for a great price or on the C&T website, but if you would like a copy signed by both Paige and I, my Etsy shop is the place to go. 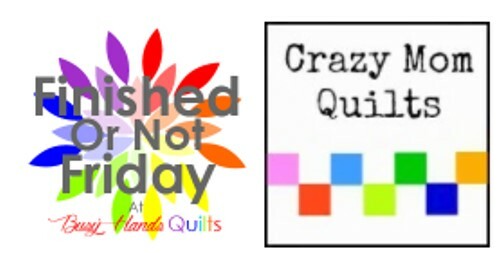 Once the book is launched I will show off some more of the quilts and in March we are going to have a huge book hop with 30+ bloggers showing off their versions of the book quilts! As part of my new year's sewing room clean up, I found a bunch of single blocks that have been hanging out on my fabric shelves too long. One of those blocks was a 24" square test block I made for the Midnight Mystery Quilt (the mystery pattern from 2 years ago). The block itself was a little too small for a quilt so I added a 5" white border to extend the background, making the quilt 34" square. 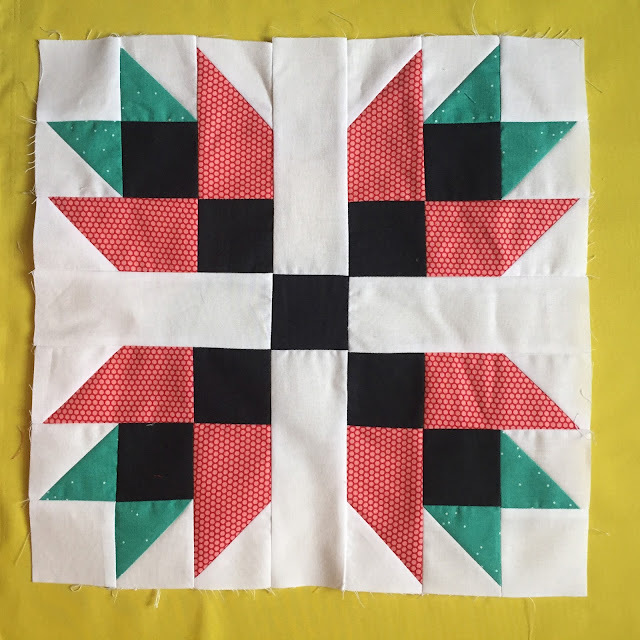 I love this size for a baby quilt, big enough for a baby or small child but still small enough to easily quilt and use a single width piece of fabric for the backing. I quilted the quilt using matching Aurifil colors and different quilting motifs for each of the section of the quilt. 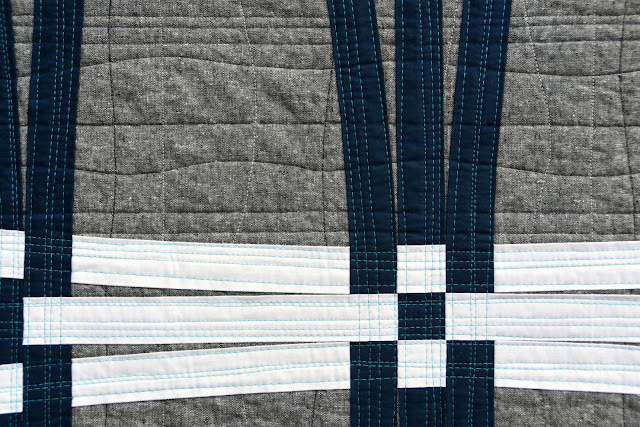 I felt that with all of the white background, the quilt needed a strong border so I cut the binding at 3 ¼" wide versus my normal 2 ½". The quilt is backed with a fun Tula Pink blue print with snails. The mini midnight mystery quilt will be donated through my local MQG (the Greenville Modern Quilt Guild) to the Greenville Hospital System where it will go to a child who has been removed from their home. 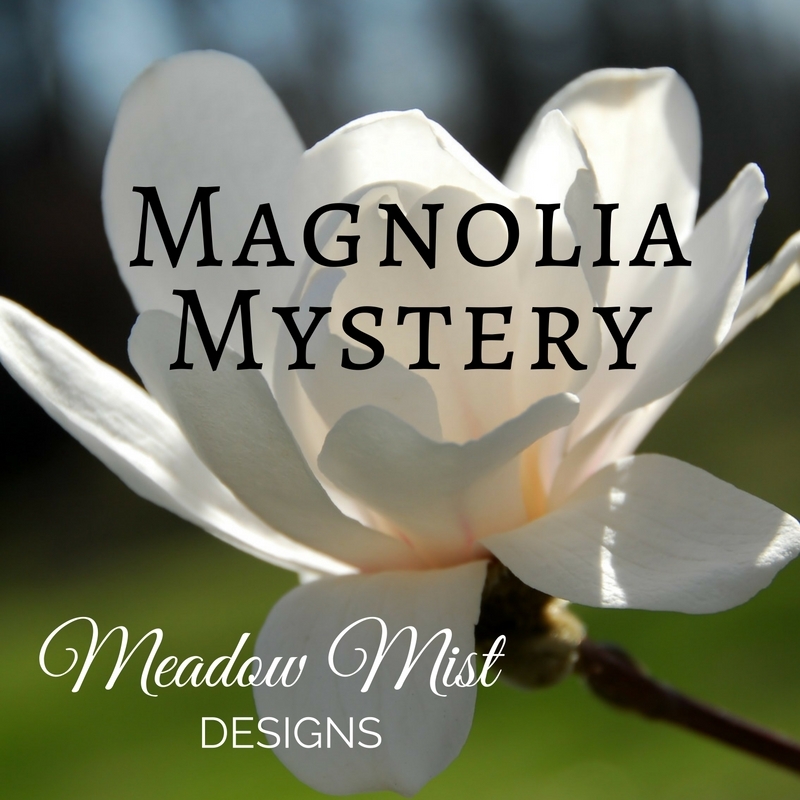 I want to give a huge thank you to all of the quilters who decided to participate in the Magnolia Mystery Quilt! I have had such fun quilting along with you over the last 6 months! There are no new instructions in January, the quilt top and finishing instructions were posted in the December post, and you have until February 15th to submit your quilt via e-mail (mmdmysteryquilts at gmail dot com) for the parade reveal and to be eligible to win prizes.